The wireless telecommunications definition does not include radios, emergency or medical devices, or in-car security or navigation systems. Also allowed are earpieces, headphone device, or devices worn on the wrist to conduct a voice based communication. Drivers can no longer hold in hand (or support with any other body part) a wireless telecommunications device. No holding the phone, no balancing it in your lap, and no squeezing the phone between your ear and shoulder. A driver cannot use the device to write, send, or read any text-based communication. No texts, emails, “DM”s, etc. The asterisk here is that you MAY initiate a text message if using a voice based communication which automatically converts to written message through that device. 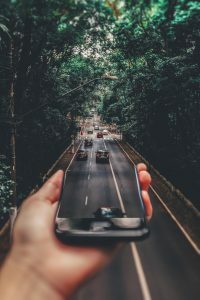 The other – and perhaps most important – asterisk included here is that the prohibition against the use of a wireless telecommunications device does NOT apply to the use of the device for navigation or GPS purposes. 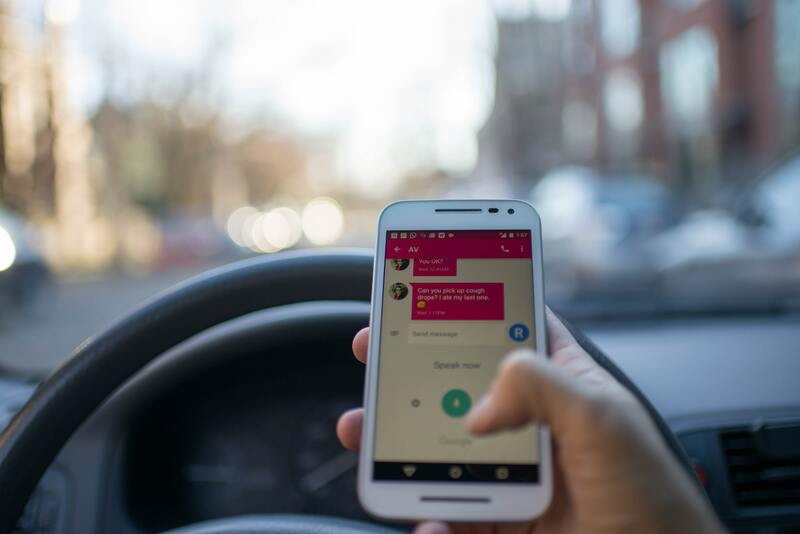 A driver also may not watch a video or movie on a device while operating a vehicle – you’d be surprised what some people do in gridlock rush hour traffic through Atlanta – other than to watch the screen for navigational purposes. Drivers also may not record or broadcast a video with their devices, which may be a direct result of the wrecks caused by drivers using social media applications to record videos or livestream. If the new addition to Georgia law is not enough to prevent you or your loved ones from using a handheld device while driving, maybe GDOT’s Drive Alert. Arrive Alive. campaign or AT&T’s It Can Wait campaign can provide some prudent information to consider before using your device while behind the wheel. One alternative to holding the device in your hand that has recently grown in popularity is the windshield-mounted phone holder. Something important to note here is that these are actually illegal in the State of Georgia. O.C.G.A. §40-8-73 provides that no driver shall operate a vehicle with any “nontransparent material upon the front windshield, side windows, or rear windows of such vehicle which obstructs the driver’s clear view of the highway or any intersecting highway.” Unfortunately, yes, this includes phone holders mounted to your windshield. 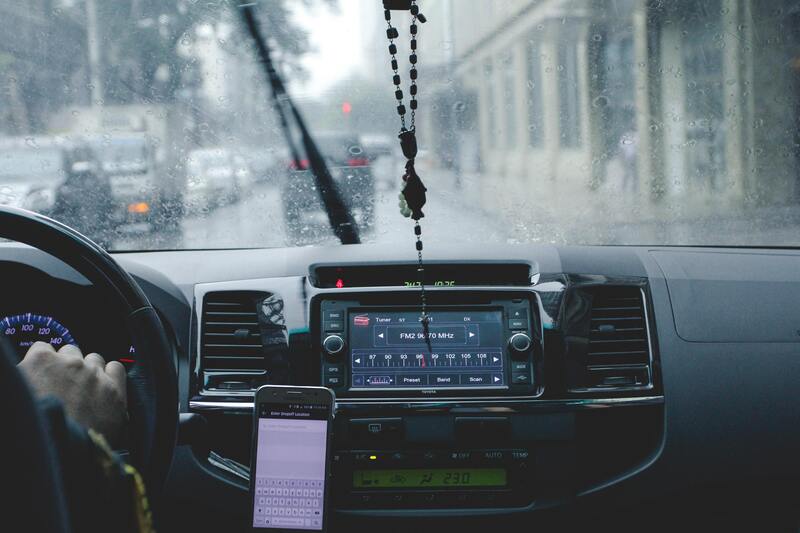 Another possible alternative to holding the device is the air-vent mounted phone holder, which enables your phone to be visible for navigational purposes without obstructing your view of the road through the windshield. Though this is a legal option for using the GPS apps on your phone, some suggest that having your phone up next to the air vent can cause water damage to the inside of the phone. It is also important to remember that for any split second you look down at your phone, even just the few inches down or over to the air-vent holder, your attention has been taken away from the road, and thus you are a distracted driver. 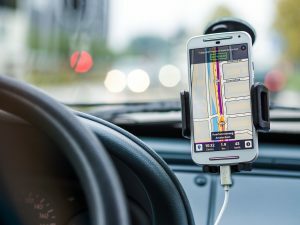 The best solution to comply with the new law and remain as safe as possible is to toss your phone to the backseat, turn sound notifications off so as not to be tempted to reach back to grab it when you hear the phone ding, and when you get to your destination safely and park, check your phone to your heart’s content. Also, making use of the audio part of the GPS apps on your phone can help to not have to look at the map as often by relying on the dictated instructions. Or, if you’re in for a challenge, tell your kids to print off the map and directions off of Mapquest and memorize them before they make their trip. Robin Frazer Clark pursues justice for those who have personal injury claims as a result of being injured in motor vehicle wrecks, trucking wrecks, defective products, defective maintenance of roads, premises safety, medical malpractice and other incidents caused by the negligence of others. Ms. Clark is the 50th President of the State Bar of Georgia and a Past President of Georgia Trial Lawyers Association and has practiced law in Georgia for 29 years. Ms. Clark is listed as one of the Top 50 Women Trial Lawyers in Georgia and is a Georgia Super Lawyer. Robin Frazer Clark~Dedicated to the Constitution’s Promise of Justice for All.